"I postpone death by living, by suffering, by error, by risking, by giving, by loving." 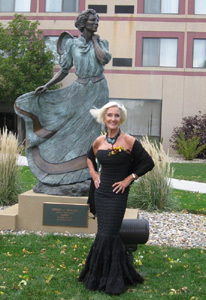 In 2008 Elaine was the recipient of the Spirit of Dakota Award. The Spirit of Dakota Award Society annually honors one woman, whose leadership qualities, courage, strength of character, and community commitment illustrate the best of South Dakota womanhood. The women nominated for this award are role models who promote the social, civic, cultural, and/or eduational advancement of others. Below you will find several milestones in Elaine's life. We take risks when we want to achieve more than the average and experience the best of life. IT'S NEVER TOO LATE! I DARE YOU TO TAKE A RISK AND GROW! I placed second in a body building contest that was NOT age grouped! I was challenged by cancer and won. I married Jerry Dunn during the Disney World Marathon, and finished the race. We were interviewed on The Today Show just after the ceremony at the Magic Kingdom. I climbed Mt. 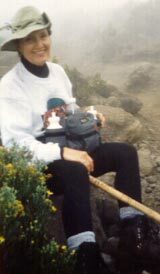 Kilimanjaro and won the marathon there the day after we got off the mountain. I won the swimsuit competition in the Golden Times Newspaper, and was featured on the front page and as the centerfold. I ran from the Atlantic to the Pacific Ocean across Panama, 60 miles, to celebrate my 60th birthday. Ocean to Ocean in a single day! I became Mrs. South Dakota, and participated at the national level for Mrs. America. I was 30 years older than the other contestants, no, I did not place! - I was chosen as the Foster Grant model for South Dakota. I completed a Doctor of Philosophy in Psychology, researching the self-efficacy of women who begin marathoning after the age of 40. Read Elaine's note; "AN EMERALD IN MY APRON POCKET". I completed the Mount Rushmore International Marathon for the 25th consecutive year. I launched the Leading Ladies’ Marathon; 26.2 mile race for women only. 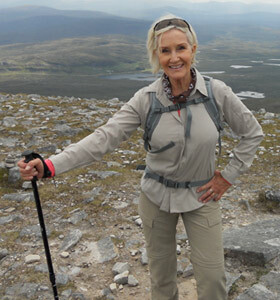 - I launched a TV series called Women Who Dare; spotlighting women who really LIVE life. - I wrote book number two, Running On….A Sole’s Journey. I was chosen as the Spirit of Dakota, an award honoring the epitome of the prairie woman. which first happened in 490 BC. on the Isle of Skye. I went to France for the Medoc Marathon and to celebrate my 75th birthday in the land of my ancestory. in 49 states & D.C.